The Xinglonggou site is located in the Xinglonggou Village, Baoguotu Town, Aohan Banner, Inner Mongolia. It could be divided into three locales. Locale 1 was a settlement dating to the Middle Xinglongwa Culture, which is about 7600BP; Locale 2 was a settlement dating to the Late Hongshan Culture, which is about 5300BP; Locale 3 was a settlement dating to the Lower Xiajiadian Culture, which is about 4000-3500BP. In order to complete the task of the Hongshan Culture settlement morphology research in the Exploring the Chinese Civilization Project III, the joint archaeological team combined with the Inner Mongolia archaeological working team I of the Institute of Archaeology, Chinese Academy of Social Sciences (IA CASS) and the Aohan Banner Museum investigated and mapped three sites dating to the Hongshan Culture in Aohan, which are Locale 2 of the Xinglonggou site, the Sijiazi Caomaoshan site, the Liujiatun site in Baoguotu Town, on May 22, 2012. On May 23 when the archaeologists went to map Locale 2, they collected red clay pottery shards and found they were the fragments of a figure’s face by piecing at the site. On May 28, the Aohan Banner Museum organized experts to go to the site again to do the collection and this time found the fragments of mouth. Then, the figure’s head, face and most of its body were recovered. Based on rich experience, Archaeologists considered this as a significant archaeological discovery and decided to do a salvage excavation. After archaeologists sieved the soil within 100 square meters areas around the spot where the pottery figure was unearthed, some small fragments belonging to the pottery figure were found. After the cultivated soil was removed, archaeologists found a near square grey soil. According to the previous experience, this grey soil might have been a house ruin. During the following salvage excavation of the house ruin, the decoration fragments belonging to the figure’s forehead were accidently discovered on July 1. On July 3, archaeologists finally found a fragment belonging to one of the arms. On July 4, when the whole house ruin was cleared, another two fragments belonging to the arms were also discovered. 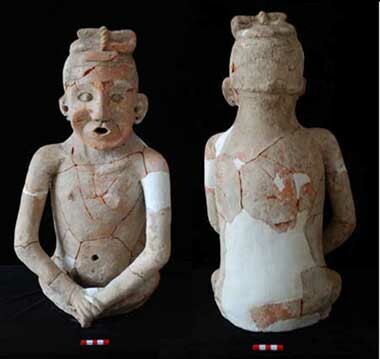 After the careful restoration by the archaeologists, this pottery figure could be recovered. It is 55cm tall with a 65cm maximum breast circumference.